Oh, the rumpus! A picture can speak a thousand words, it seems, but what it says to each of us depends heavily on our culture. Yesterday I wrote my take on Side View’s weekend theme: this week, it was a picture of a corridor which led away from the picture to a door at its vanishing point. And it made me most uneasy. Not so most of those who looked at that picture: for most, it was a benevolent place leading to mysterious – but jolly nice- outcomes. Bemused, I showed Sidey’s picture to my husband Phil. “Is that a friendly picture or a threatening one?” I asked him. He was unequivocal. Threatening, he said, because it looked like one of our Victorian prisons or mental hospitals. It is possible this is a British thing. An explosion of architecture which was stunning on the outside, controlling and threatening on the inside happened in the Victorian era. In Britain we have seen too many of these cathedrals to the efficient Victorian handling of society’s problems. The great architects often had a hand in designing them, but the memories of my generation are of visiting someone there or chancing to encounter the places. We watched documentaries about the methods of treatment in the 1950s and shrank from the very images of the places they happened. Unhappiness hung in the air. Take a look at these pictures of such corridors, taken by a variety of artists, here, here and in this article. However, in my quest for a set of happy corridors I trawled my picture libraries. I found picturesque ones, ancient ones, utilitarian ones, yes; but not a corridor which drew one simply to happiness. Here’s the results of my trawl so far. hmmm, big houses in hot countries could spread out along long passages, allowing in breezes at every opportunity. maybe that is part of the difference? Possibly. That link – between the beautifully designed and proportioned corridors of so many of our public institutions, and what took place there – is peculiar to us. Look at the comments from British people yesterday and today- they often feel the same way; those abroad seem much more disposed to see the picture as benign. Your links to the psychiatric hospital explain how your perspective might differ, Kate ~ the resemblance to Sidey’s pic is uncanny. I’m glad you can see it, Nancy. It’s just a business of association. I don’t care for the Dover corridors at all. The one leading down into the White Cliffs is narrow and claustrophobic, with no windows. Eek! Architecturally necessary, perhaps, but still forbidding. The one in Dover Castle is so narrow! Even with a slit of a window, the colors in that one are cold. Corridors that lead down or into darkness are naturally going to be more forbidding than those that lead up, out, and into light. Dover is scary, Strawberry Hill looks inviting. Something to do with letting in light. Hampton Court Palace is beautiful. The corridor to the Dover cliffs looks like a place on the way to a dungeon. Not sure I’d be hanging out by the ones at Dover Castle. Looks spooky. But some of the other corridors are more upbeat. 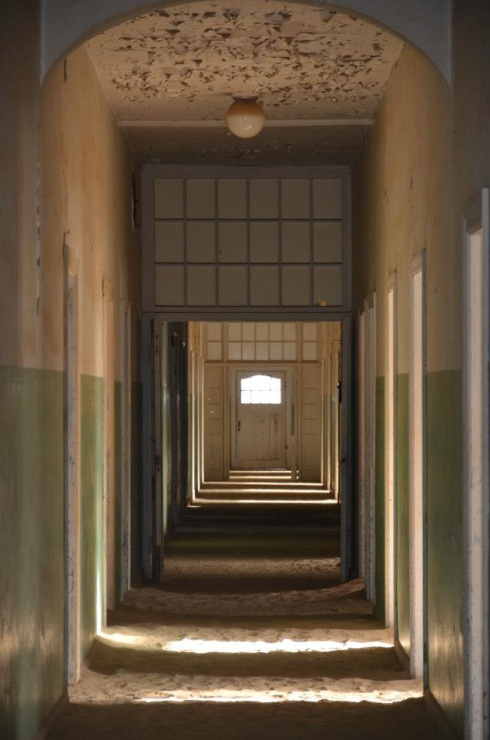 One could certainly imagine walking along the lighter corridors without company. On one of these corridors I have been haunted: one of the brightest of all! That was certainly my feeling, Madhu. I found it most interesting that the corridor in the picture Sidey provided is covered in sand, and this had led me on a different rack entirely…..an indoor place that is now outdoors and unprotected from the environment. I think that’s a fabulous angle, Pseu. Reminds me of the ruined cloisters of an abbey I went to. I thought it was Robben Island prison. I was also reminded of the film Safe House, which wasn’t. The reaction I am getting from most of us Brits, Tilly. We must all carry the same baggage. Perhaps it is, Laurence. When you tweeted the pic I would have to say even the amount of light there is at the end of the tunnel does not make me want to venture inside. I could weep for Trisha and her story. We think of these archaic treatments as being centuries ago; to hear her story and realize it is a very contemporary one is startling. What a brave woman she is to tell her story and to have gone back to West Riding to photograph it. I can certainly see how Side View’s theme made you so uneasy, Kate. 🙂 It’s amazing how one accumulates corridors, without even realising it, Tandy! We’re hardwired to be pattern-seeking, and your pictures corridors certainly awake or evoke memories of other corridors I/we have walked down or glimpsed in passing. If there is a bare regularity that suggests conformity I would suggest we feel uncomfortable and reticent about proceeding, hence all the comments about prisons and hospitals. If however there is interesting detailing such as architectural features or pictures, and especially if there is a suggestion of more attractions in the middle or far distance, we become more intrigued, mentally imagining ourselves moving forward examining those spaces. Even more tempting is the hint of more to see in side rooms that we can just glimpse from our limited viewpoint. The ideal picture (whatever the subject) draws the eye in, encouraging us to explore; if we are reluctant to explore, the picture will repel or at least unsettle us. As always, great pictures! If each one is worth a thousand words, my feeble comments will barely begin to do them justice. Certainly are some spooky trails…lends to purgatory without end. Corridors without doors. Hotel California, with all the whistles and bells, where you can check in, and be a star, but once there… never seen again. Wondering why the institutional interpretation didn’t really come to me – perhaps because I look upon mazes of passageways, as with caves, as something leading to adventure.